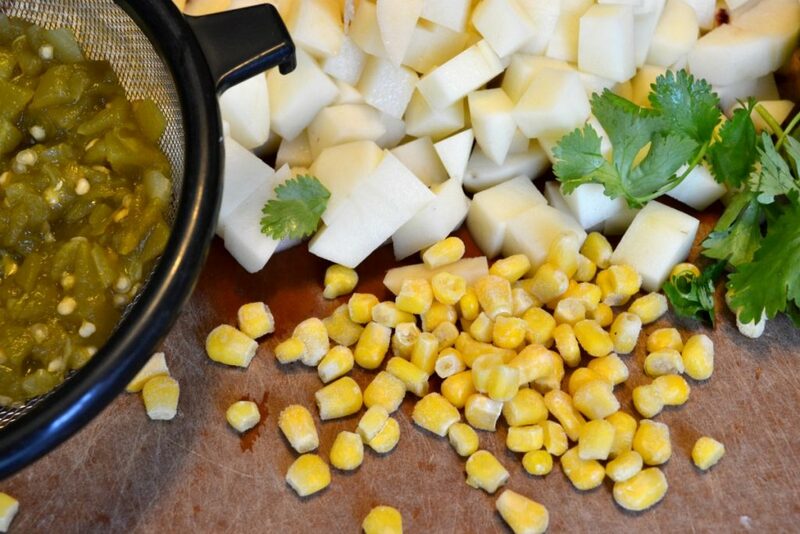 This versatile corn chowder recipe blends the flavors of summer with the comfort of fall. It’s extremely versatile (spicy or mild; fresh, frozen, or canned ingredients) and it’s also dairy free, vegetarian and gluten free, with an option to make it into a vegan soup. Summer is winding down, which means I’ve got soup on the brain. A quick peek at my recipe index will tell you that I LOVE soups and stews, and I’ve been dying to create a new easy soup recipe for fall. 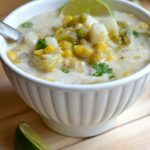 This corn chowder recipe is the perfect one to share now because corn is still in season, and it’s also hatch chile time here in Texas. So even though it’s August…soup’s on! 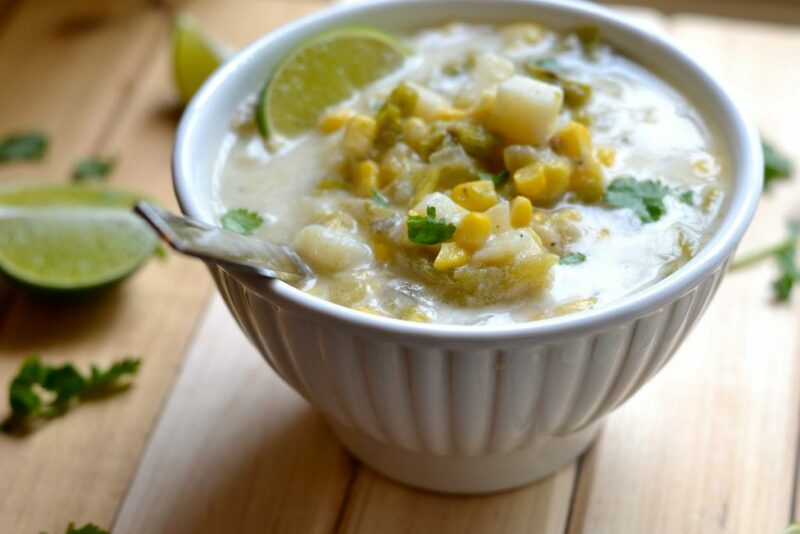 The nice thing about this soup is that it can be made with fresh corn and fresh green chiles, or frozen corn and canned chiles, and it tastes great either way. It’s truly an all-season soup that you can enjoy any time of the year. 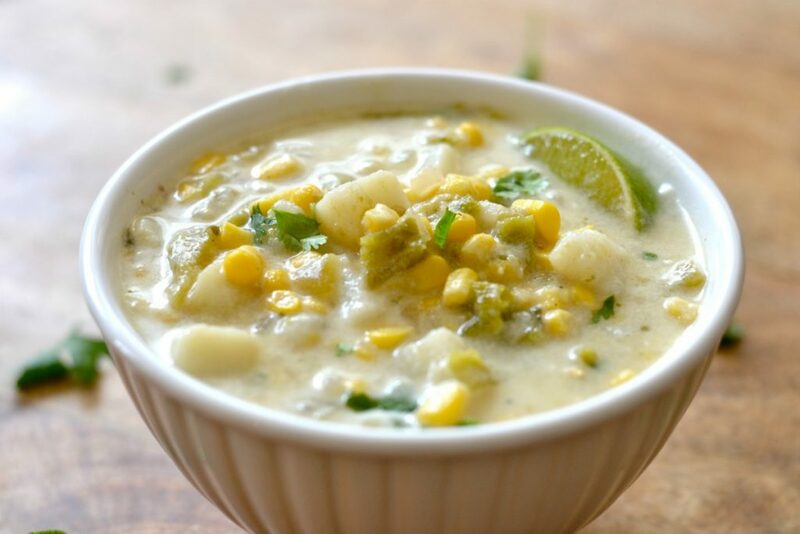 This corn chowder also falls into the “crowd pleaser” category because it can be easily modified for a range of diets and preferences. You can make it spicy or mild depending on the type of green chile you use. You can even make it mild AND spicy by using mild chiles and passing a shaker of cayenne to anyone who prefers a little heat. The recipe I’ve written is dairy free (using coconut milk instead of cream), although you can use heavy cream if that’s what you prefer. I set out to create a dairy free version because of my daughter’s dairy allergy, but I discovered that the flavors of this soup blend so well with coconut milk that I actually prefer it to a typical cream-based chowder. Especially when you add a little squeeze of lime at the end. You can also make this into a vegan soup if you use vegetable broth in place of the chicken broth. If you’ve got a vegan in your life, they will love you forever! I absolutely love green chiles in all forms, the spicier the better. But I understand that not everybody is a spice fan. I’m here to please, so I’m giving you options. The first time I made this soup, I used fresh hatch chiles since they are everywhere in Houston. The hatch chile version was a hit with my husband and I, but it was a little too spicy for the kids. The second time around, I used canned mild green chiles, and my husband and I added a little dash of cayenne to our bowls to spice things up. That time, we were ALL happy. You can also try poblano chiles or any other chile you happen to like — just make sure you do a chile taste test before adding the chiles to the soup so that you can adjust the quantity accordingly. Cooking Note: If you’re using fresh chiles, roast them first by placing them in the oven until the skin is blackened and blistered, then letting them cool in a sealed plastic bag, peeling off the skin and chopping). 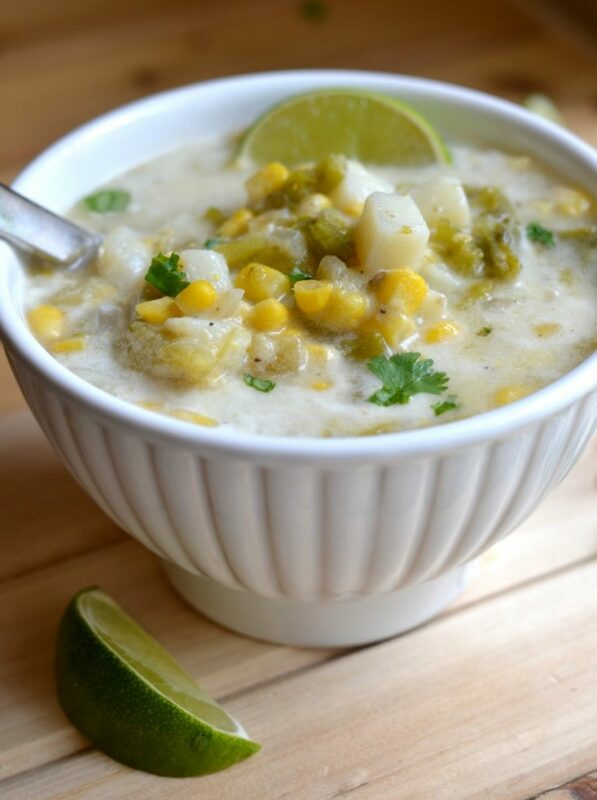 This green chile and corn chowder is an all-season soup that can be easily modified to make it a vegan soup. In a soup pot, drizzle olive oil and sauté onions and garlic until soft. Add broth, salt, potatoes, and bay leaf. Bring to a soft boil. Cook until potatoes are just barely cooked through (approx 10 minutes). Add corn, paprika, pepper, cilantro, chiles, and coconut milk. Simmer softly for about 5 more minutes, or until corn is tender. Add additional salt and pepper to taste, if needed. To thicken the soup, remove approx 3 cups of soup to a blender. Blend and return to the pot. Serve with a wedge of lime to squeeze over the soup. You can use a variety of chiles in this recipe, including hatch, poblano, or green chiles. Canned chiles work great, too! Just be sure to taste test the heat of the chiles before you add them to the soup. I recommend using mild chiles and adding some cayenne if you'd like to spice things up. *If you're using fresh chiles, roast them under the broiler until the skin is blistered. Then place them in a sealable ziplock bag until cool. Remove the skin and seeds, and dice. Can this chowder be frozen? I live alone and I love this but can finish all of it now. I like to freeze individual servings for later! I think it would be fine to freeze. Sometimes soups with coconut milk or any other type of milk don’t freeze well, but because it only contains a small amount, I think it will be OK.